This review is a revision of my original one written covering both Zoro's book and DVD, The Commandments of R&B Drumming. The reviews have also been separated. The author of R&B drumming grew up listening to R&B music in South Central Los Angeles. He's been playing drums professionally for 20 years. When I first heard his name  Zoro the drummer  I must admit, the first thing I wanted to know was "Where's the mask?" I also wondered if he played drums with little sword-shaped sticks. But hey, with a nickname like Tiger Bill, who am I to talk? I recently had the chance to hang with and perform with Zoro at a PAS Day of Percussion and the truth is that Zoro is one together dude who has poured his vast knowledge of R&B into this project. Let's check out the book and audio CD. The book is divided into four main sections in addition to a foreword and conclusion. Foreword: Zoro includes a glossary defining some terms important to drumming, discusses the role of the drummer in music, history of the Drum Machine and why you should try to emulate one, playing with a click track, and explains one of the most common patterns used in R&B - the Sextuplet. Brief historical overview of the era. Developmental exercises and grooves. This includes a song you can play along with using the accompanying CD (The song is recorded twice, the first time with Zoro drumming and the second time without). Top ten landmark record albums from the era. 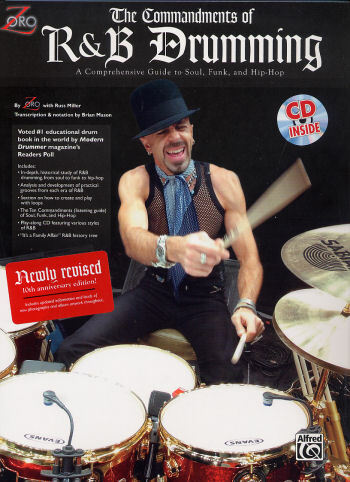 Recommended Drum instruction books and videos, books for history and research, and concert videos. The 50 Most Frequently Covered Songs from the era: A list of songs that you're most likely to find yourself playing on an actual gig. In addition to an original song that you can play along with (one for each era), the audio CD contains more than 60 examples of exercises taken directly from the book. Chapter Four: Developing Your Own Grooves - This chapter is designed to help you take what you've learned so far and use it to develop your own drumming style. It includes Zoro's method for practicing "time" feels along with some drills to help develop your bass drum endurance, hi-hat patterns, and use of 32nd notes. It concludes with a Play-Along section where you can practice along with loops on the included audio CD. Bottom Line: Are You a True Believer? Zoro is a true student of music, specifically the vast R&B genre, owning a collection of CDs that numbers in the thousands. He has tapped his wealth of knowledge to produce a detailed book and audio CD on the subject. The newly revised 10th Anniversary Edition of the book/CD adds some cool updated information plus tons of new photos and artwork to the original and the price remains the same as the original version. Zoro knows his R&B drumming and he knows how to get his message across (even without the sword and mask). I also applaud his stand on drugs as he says, "Drugs are only a path for destruction, they cannot promote success; only practice, hard work, and persistence can do that." I couldn't agree more. I can tell that Zoro has put a lot of hard work into the production of his Commandments of R&B Drumming book/CD and DVD. In preparing for this review I've spent some time with his commandments, and he's made a true believer out of me. Study them for a while and I'm sure he'll make a believer out of you too.